For once I'm actually with the RMT. Tube drivers are considering a ballot for industrial action over safety in what has been the "worst week" of chaos on the Tube because of signal failures, faulty trains and staffing problems. 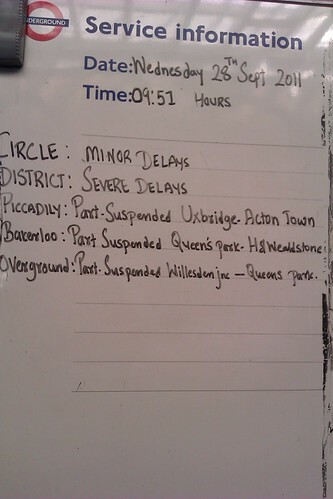 The District Line has been absolutely rubbish this week and also last week (see picture above). There's been no other way to describe the delays, gaps between service and track problems on that line. I've been putting in a Customer Charter form for compensation almost every day. The Evening Standard said "District Line passengers were worst hit with nine severe delays, suspensions and closures, while users of the Circle Line suffered inconvenience following four line suspensions, said Labour, adding that in the last six days the District and Circle lines were both suspended three times and the Victoria, Hammersmith & City Line and Northern Line were all part-suspended once." Labour's transport spokeswoman Val Shawcross said in The Guardian: "I can't remember a worse week of delays on the Tube. No line has been spared delays this week with severe delays and whole line suspensions causing huge inconvenience to the daily lives of millions of Londoners. "It's simply not good enough when Londoners tell me that delays are the norm, not the exception, whilst they are paying record high fares to use a Tube service which we cannot rely on. "While Boris Johnson was boasting about how great London's Tube services were to the Conservative Party conference this week, millions of Londoners were stuck on Tube trains." Bob Crow, in normal bullish mode said "RMT has demanded an end to the reckless policy of expecting drivers to override door fail-safe systems after a potentially fatal incident in which a passenger jumped from a moving train and another was caught in its open doors. "Despite that, the 'sensitive edge' procedures, along with a whole bunch of other unsafe procedures, are being bulldozed through in the dash for cuts, and to cover up the impact of reductions in station staff, under the guise of "operational effectiveness". "It is our members who have to deal with the consequences of these ill-conceived policies. We have tried to get LUL to see sense, but they have continued to put cash and job cuts ahead of passenger safety and we now have no choice but to ballot for action to put a stop to these dangerous proposals being imposed without agreement." Interestingly I've had no word back from @TfLOfficial on my tweets last week asking why the District Line was so shocking last week. 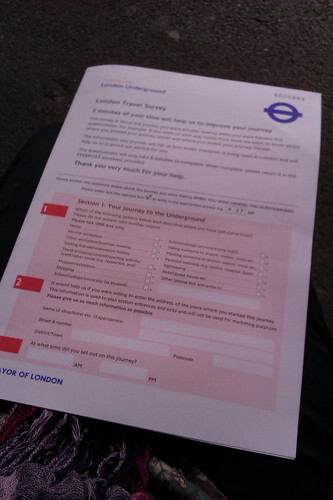 I was particularly galled as TfL were handing out a survey on a day when the service was really, really bad. Perhaps now the unions are threatening to strike they may start to look at why the service was so bad in the last couple of weeks.